Early Otho and son James Leroy Miller with a working pair of mules. Early was better known as Bill and James Leroy was always called Jim Bob. Kathleen M. Hawk was appointed Director of the Federal Bureau of Prisons on December 4, 1992. She is a native of West Virginia and attended Wheeling Jesuit College and WVU. Marian McQuade (1917-2008) campaigned in West Virginia and later nationwide to set aside a day for grandparents. In 1973 West Virginia became the first state with a special day to honor grandparents when Gov. Arch Moore proclaimed May 27, 1973, Grandparents Day. In September 1978 the White House called her to inform her that President Carter had signed a bill designating the Sunday after Labor Day as National Grandparents Day beginning in 1979. In 1989 the U. S. Postal Service issued a tenth anniversary commemorative envelope bearing the likeness of Marian McQuade in honor of National Grandparents Day. She was born Marion Herndon in Caperton and later lived in Oak Hill. Nancy Hart (1846?-1913) was a noted Confederate scout, guide, and spy. Hart ran away from home at the age of 14 to join a band of rebel raiders known as the Moccasin Rangers. In 1862 she was captured by Union forces but escaped from jail in Summersville. After the war Nancy Hart Douglas and her husband Josh lived at Spring Creek in Greenbrier County. She also had lived in Roane, Calhoun, and Nicholas counties, but was born in Raleigh, N. C. She grew up on Greenbrier Road near Richwood. She is buried at Manning Knob near the Nicholas-Greenbrier county border. First of all have you ever seen a $2 dollar bill? The reason the $2 Dollar bill is of interest to members of Art's List is the picture on the back. Former U.S. President Thomas Jefferson is featured on the obverse of the note. The painting The Declaration of Independence by John Trumbull is featured on the reverse. The design on the obverse (excluding the elements of a Federal Reserve Note) is the oldest of all current U.S. currency having been adopted in 1929; the reverse is the second oldest design having been adopted in 1976. If you look close at the names in this painting you will see some very familiar names; Hewes (Hughes), Livingston, Hall. 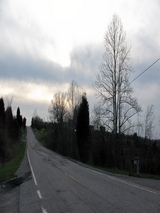 We know that Hews connects to our Hughes on WV Route 87. I am still researching the Livingstons and Halls. A key to the names is included in this document. Status: Located; View from cemetery looking towards church. Status: Located; View of Cemetry looking toward the church. May not be the right place for this but fits the majority of the people in picture. Smilin Dale Roseberry By Clicking on View this item a copy of the pamphlet mentioned below will download. If you have dial-up it may be slow to load. It is a PDF File. Cecil Dale Roseberry (Smilin Dale) and his brother Lovell Lee "Bus" Roseberry were popular "hillbilly music" artist. They appeared on several radio programs and made many public appearances. They were on their way to becoming big stars. This dream was cut short when Cecil Dale was killed in a car wreck in Grundy, Virginia on 19 September 1941. Entertainers as a way to keep in touch with their listeners, keep their fans updated on what the artist was doing, where their next public appearace was going to be often wrote newsletters. They also wrote little books about themselves and songs and music they had written. These books were mailed out to the listeners. The cost of the books was a nominal amount. (usually just enough to cover postage) The request for these newsletters and books was a way to let keep the station manager informed of the artist popularity. After "Smilin Dale was killed in the car wreck people wanted to know what happened and how his family was getting along. In response to those request Bob wrote a small pamphlet about the life of his brother "Smilin Dale Roseberry". The book contained a short bio of Dale's life and some of the songs and poetry that he and Cecil Dale wrote. This booklet was mailed to listeners of their radio programs. Abiajah Turner and Lou Roseberry Herdman lived here all of their married lives according to family sources. This old homestead has been gone for many years but not forgotten. This is Abe Herdman's funeral Elizabeth Lib Herdman is in black beside him and the little boy in picture is my grandpa Dencil Matheny Aunt Lib took him in and raised him after his mom died. This picture was probably taken at the Old Mount Tabor Church Cemetery where he was buried. Albert H. Sissons, wife Amy Belle Miller Sisson with their young son Albert. Albert Sawyer Family Can you match these faces with the faces in the older Sawyer Family Photo? Alta Matheny Miller - She is beautiful! in the 1920 census there is a William Anderson living at the poor house at Cottageville, WV shows he was married age 72 would made it about right for this one..
Also an Andrew Anderson age 68 widow. Anna Jarvis - Founder of Mother's Day A printed card means nothing except that you are too lazy to write to the woman who has done more for you than anyone in the world. And candy! You take a box to Mother—and then eat most of it yourself. A pretty sentiment. —Anna Jarvis. The modern Mother's Day holiday was created by Anna Jarvis in Grafton, West Virginia, as a day to honor mothers and motherhood; especially within the context of families, and family relationships. It is now celebrated on various days in many parts of the world, some of which have a much older tradition than the modern holiday (e.g. dating to the 16th century in the UK). Father's Day is a corresponding holiday honoring fathers. The holiday eventually became so commercialized that many, including its founder, Anna Jarvis, considered it a "Hallmark Holiday", i.e. one with an overwhelming commercial purpose. Anna eventually ended up opposing the holiday she had helped to create. It is about time some of you youngins took over. The job is always easier when shared. Where do you think you are going? Get back here! Just a dab more sugar! Baden Presbyterian Church was organized November 12, 1895, and built on land given by L. H. & Maggie Baird. The carpenters were Ed Kinzel, Jim Johnston, and Mr. Matheny. The bell was given by Mrs. Lewis Schwarz. The first pastor was Rev. Rogers. The first trustees were Lewis Schwarz, A. H.
On WV Route 87 in the 1940s and 1950s, Baden Store on Baden Ridge, Lloyd and Minnie Casto's at Gunville, and the Rolling Store which came through every Wednesday, were the only places to buy the staples of life. Going to the store was a treat. Dad would hitch up the team about once a month and the family would go to the store. All of the other necessary things of life - salt, sugar, coffee, store bought candy, tobacco and chicken feed were bought at these stores. The chicken feed came in beautiful cotton print sacks. I have had a many a dress and quite a few pair of bloomers made from those feed sacks. The Rolling Store was a semi-truck with shelves that held canned goods, and all of the other things we needed. If you wanted something special you would order it and the next week the Rolling Store would deliver it. When I went to Longview School the teacher would let us have recess when the Rolling Store came by; you could buy the world with a nickel back then. I was reminded in an email the other day that the 'ROLLIN STORE" was run by John Morgan. I did not remember his name just the fact the store came from Galpolis, Ohio.